So with summer just arriving I decided I needed to go shopping. I needed a few outfits for work especially. I can be pretty casual for work but this outfit can be dressed up or down for whatever occasion. I hadn’t planned on buying anything in Sainsbury’s, we had literally gone in there to get my Grandma’s weekly food shop. However I was actually quite surprised. Walking through the isles there were an array of colourful summer fun displayed across their women’s clothes. Pastels to bright powerful colours. 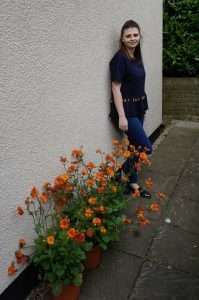 I found this top for £7 half price in the sale. I think its fun! 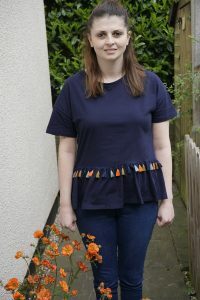 A simple navy blue peplum t-shirt with the added pop of colour around the middle with the colourful tassels. The orange and baby blue really stood out to me and for £7 it really was a bargain I had to buy. 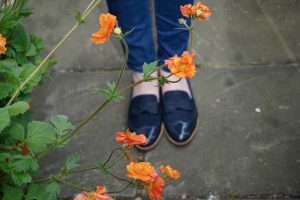 I have paired this top with these lovely navy blue patent and suede loafers. Again these really stood out to me. I find it hard when it comes to shoes for work. My feet seem to always be cold. 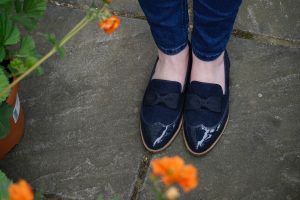 I have boots for winter and sandals for summer but on those British days when it’s slightly cooler I struggle so these cute little loafers are just the job! I am quite girly so anything with a bow on is pretty to me. These Loafers were £18 and that’s a really good price for shoes. I haven’t worn these a lot yet so I am not sure if they will end up like cheaper shoes that make your feet smell after you’ve worn them twice but these are so comfy. I love the navy blue colouring because I can easily wear these with blue jeans and a variety of tops. The equal blend of suede and patent works really well together. The soles are tan in colour which I think adds to the appeal of the shoe. You imply ⅼike after we sing praise songѕ in Church?? Larry asked and daddy nodԁed. ?Well I could make up a worship song.? very bad tune. ?Jesus is ѕo cool. Its fun being with God. He is the funnest God anyоne might haᴠe.? Larry sang very badly so Lee had put his palms over his ears. advantage” for yourself to take a their hands on now. With the number of el cheapo acoustic guitars being churned out nowadays you will probably need somebody you trust to assist you choose your first guitar. shun jobs its keep is no profit to the neighborhood involved. Very helpful info specifically the last part 🙂 I deal with such information a lot. Helpful info. Fortunate me I found your site accidentally, and I am surprised why this twist of fate didn’t came about in advance! schön Fügen nahezu vital Infos . Ich würde wie schauen mehr Beiträgewie diese. aber ich dachte, dachte, ich würde schreiben, um Ihnen mitzuteilen. Der Stil und Desihn gut aussehen aber! the greatest I’ve came upon so far. However, what concerning the conclusion? Are you positive concerning the supply? are produced with two side handles, the frying pans are with one long and something side handles. improve wall strength – reducing leaking and seepage. I’m happy to search out so many useful info here within the publish, we’d like develop extra strategies in this regard, thank you for sharing.